The latest round of the Theatre Improvement Scheme, in association with the Wolfson Foundation, will offer theatres grants of up to £20,000 for projects focusing on Improving Environmental Sustainability. Protecting the environment is one of the biggest social issues right now and the theatre sector is keen to be more environmentally sustainable. While operational changes can make a difference in reducing energy wastage and carbon footprint, major energy consumption comes from heating, ventilation, stage machinery and lighting. Sadly, many of the UK’s stock of more than 1,000 active theatres, particularly the older ones, do not meet today’s environmental standards. Theatre buildings and the plant that services them are in desperate need of investment to make them more efficient. In a recent Theatres Trust survey of theatres planning capital works in the next 5 years, 50% cited environmental improvements as one of the key reasons for the works. It is hoped that these grants will support a range of projects that consider different ways theatre buildings can reduce their environmental impact. 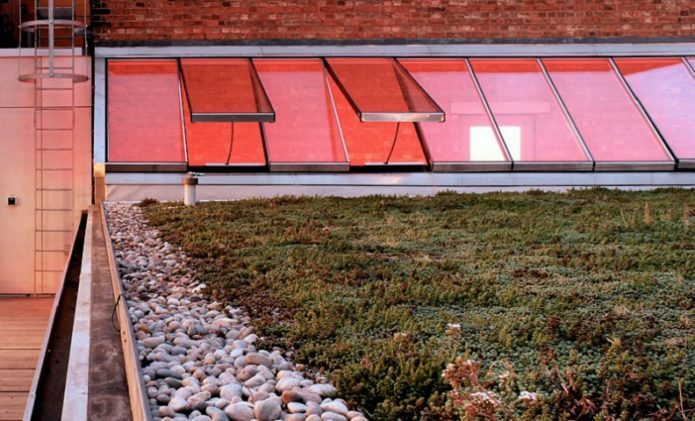 From sedum roofs to new windows, building management systems to more efficient water heaters, funding will be given to projects that demonstrate how a small intervention can have a big impact. Theatre operators can apply for grants of up to £20,000 towards their building or equipment as part of the scheme. The deadline for applications is Friday 13 September 2019. Full details of the scheme are available on the Theatres Trust website. The post Opportunity: Theatres Trust launches new grant scheme to improve environmental sustainability of theatres appeared first on Creative Carbon Scotland. ‘Brave!’ That’s what a fellow theatre director said to me when I quit directing to work on setting up Creative Carbon Scotland. I have an idea they really meant ‘Stupid!’. Whether they’ve changed their mind I don’t know, but Creative Carbon Scotland is eight years old and the climate crisis is now on the agenda of the Scottish cultural sector in a way that it simply wasn’t when I started. That responding to the climate crisis is now part of cultural organisations’ work and practitioners’ thinking isn’t just down to us, of course: society is much more aware of it overall and regulations, news stories and campaigns all make it part of the general discourse. It’s sometimes tricky to know whether our work has had much impact at all, and this is something we’re determined to get better at understanding with some work this month on how we go about doing so. One area where we can be confident though is in our work with various strategic organisations where at least some of our work has paid off. Most obvious is the work with Creative Scotland – the main body distributing Scottish Government and National Lottery funds to the arts, screen and creative industries. Creative Scotland was interested from the start but climate change wasn’t top of their agenda – we needed to demonstrate that there was also interest within the sector. Even then it took some time for crucial elements to get started. Creative Scotland had been discussing with us the idea of introducing carbon reporting for some organisations from 2012 or 2013, but it wasn’t until 2014 that they finally announced that Regular Funded Organisations (those arts organisations receiving funding for a three-year period) would need to start measuring and reporting their carbon emissions from 2015/16 onwards. The success of this meant that the always-planned next step – a formal way of planning to reduce carbon emissions rather than just measure them – was easy to introduce, and Carbon Management Planning began in 2018. That gives some idea of how long these things can take. But constant discussion and working closely with the staff there now means that Creative Scotland are thinking about how climate action can be integrated into the processes for other funding streams. This is a big step forward. In the autumn of 2018 I delivered training for most of the Lead Officers that have direct responsibility for the relationships with Regular Funded Organisations. In the past this sort of work has been more ad hoc: some years ago I provided some training for organisations which had received capital funding, but not directly for the staff involved. Next year we hope staff and funding recipients will start having training workshops together to share and develop their joint knowledge. We are in discussion with Creative Scotland’s new film unit Screen Scotland to talk about how it should act on climate change. The BAFTA schemes Albert and Albert+ are already used by many producers when planning productions and we have supported BAFTA in providing Albert training in Scotland for some years, and this is now becoming more formalised. More recently we’ve extended our work with other strategic organisations. We’ve always been members of and provided specific advice to the Edinburgh Festivals’ Environmental Sustainability Working Group – the experience from that and work with a pilot group of theatre, dance and music organisations which were members of the Federation of Scottish Theatre informed our training work from the beginning. 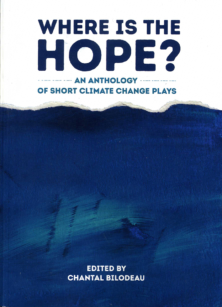 We’ve now done workshops with staff from both the Federation of Scottish Theatre and Youth Theatre Arts Scotland exploring how they can mainstream work on climate change, building it into their other work. ​ISM brings together into a single figure the main factors from the three disciplines most concerned with understanding behaviour: behavioural economics, social psychology, and sociology. The factors are arranged into three contexts, symbolised by a head (the Individual) in a circle (the Social) in a square (the Material). Evidence from reviews of international behaviour change interventions suggests that lasting change requires action in all three contexts (Southerton et al, 2011). 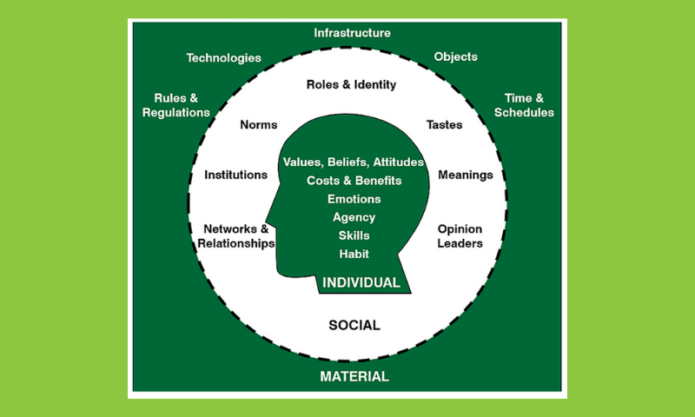 The aim of the ISM tool is to move away from the focus on the individual and getting them to ‘change their behaviour’ and instead acknowledge the complex web of factors that lead to individuals acting in the ways that they do. Although I have some misgivings about it, rather than having any argument with the thinking behind it this is because I have found that in the demonstrations of it and reports I have heard of it being used, people still tend to end up focusing on the individual. 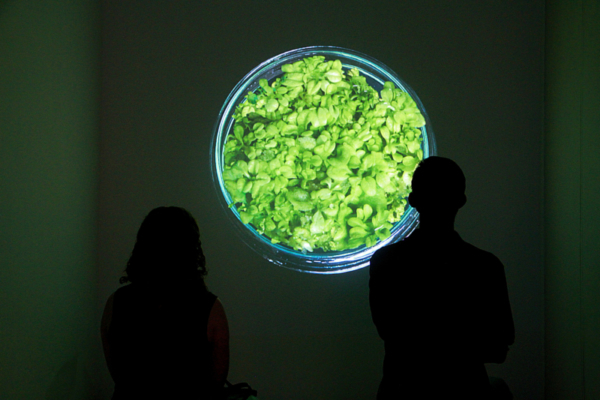 Our work with Individuals includes the Green Tease and the Green Arts Initiative. 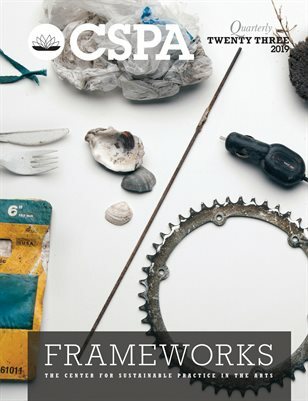 Our work with Organisations includes the Carbon Reporting and Carbon Management Planning work we do with Creative Scotland and it also includes the Green Arts Initiative, which is about the organisations as much as the individuals who work in them. 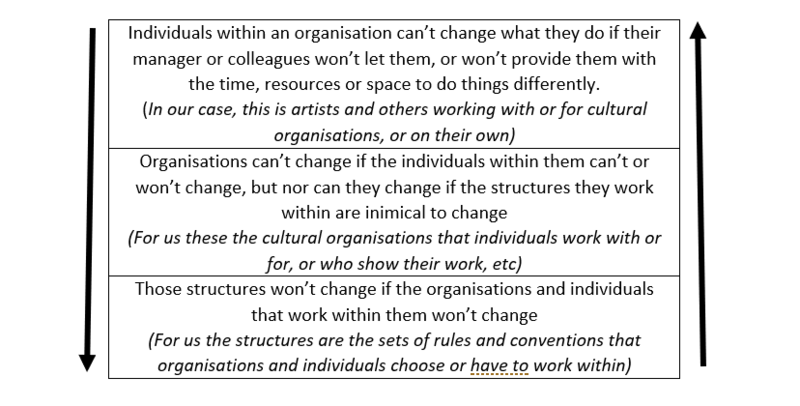 In our Structures work – which is the work I’ve been writing about above – we try to bring about change in the ‘rules’, formal and informal, which govern and affect the way organisations and indeed the whole of the cultural sector works. One reason therefore for working with our partner strategic organisations is to mainstream those areas of work so that we can concentrate on the next steps. By helping them to integrate into their core work ideas and processes that we have tested and know work, we can clear some of our own time to focus on more strategic actions that will take us all to the next level. But the other reason for writing about this now is because, just as the public awareness of climate change has increased, so has the urgency of the situation. The Intergovernmental Panel on Climate Change’s (IPCC’s) 1.5° Report last year, a recent paper suggesting that the oceans have been absorbing extra heat at the rate of 5 Hiroshima nuclear blasts per second, the fact that Scotland’s excellent progress on decarbonising the energy supply is masking our failure to reduce the harder areas like transport and agriculture: all these point to the need for more, faster action now. Those strategic organisations we already know, and others we want to engage with, need to get more ambitious in their climate action and we will help them do so. The post Ben’s Strategy blog: How we bring about change – Individuals, Organisations and Structures appeared first on Creative Carbon Scotland. The first step for any artist is working out what to write about. 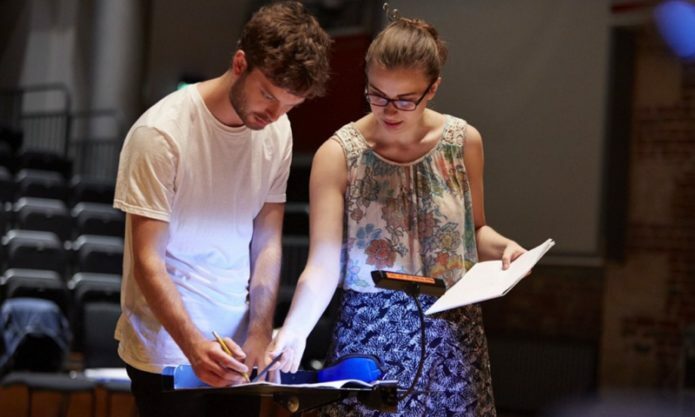 In this guest blog London Symphony Orchestra (LSO) Soundhub Composer Lillie Harris leads us through what the process was like for her writing her new piece ‘Consumption’ . Before I had even properly started my LSO Soundhub piece, I knew that the crucial ingredient in the piece would be an emotional core, addressing a social and political issue. Reaching the end of that particular work was unusually difficult, and I learned, (much like the bungee jumper might) that an important part of my composer-self requires a clear emotional or narrative purpose. No ifs, no buts. So my initial plan for this second year of Soundhub was to write a piece about social and economic inequality, and the frustration of waiting for unequal systems to change. It was inspired by the incredibly moving BBC Panorama episode about health inequality. I had scribbled down my feelings straight away like a diary, outlining the ‘characters’ I wanted to embody in the differing musical ideas, then refining them, excitedly describing how the opposing musical ideas would influence (or rather, not influence) one other. But as days started to trickle by, I found myself oddly reluctant to get going, despite my initial passion about the piece. I realised that I was nervous about telling a story that’s so very personal for many people. My own experience has been relatively fortunate: ‘The System’ wasn’t an antagonist for me when I was growing up. Student loans notwithstanding, I didn’t really feel equipped with enough first-hand experience to do this topic justice. After some deliberation, I found a story that I feel informed enough to tell: the story of humans and the natural world – and more specifically, our relentless battering of it. My initial plans had centred around two opposing voices; with the shift in focus, they made even more sense: a domineering voice ploughing relentlessly on doing whatever it wanted, and the other, desperately trying to get its attention. As the recent flood of articles about the environment came through, reinforcing in ever more pessimistic language the reality of the situation we are in, I felt emboldened by my choice. So the title became Consumption, a play on the literal consumption of natural resources, but also the historic term for tuberculosis: a nasty, infectious disease that consumes the life and vitality of sufferers. The opposing material in the piece became a) the natural world – full of variety, space, tiny flitting fragments, a natural chaos but also moments of unison; and b) the human capitalist economy: relentless, unending, rhythmic, and increasingly toxic. Art can inspire people in ways facts cannot, as Ben Twist, Director of Creative Carbon Scotland, describes in his excellent TED talk, Why the arts are essential in addressing climate change. I’m not a climate scientist, but I am a composer. And if I can write a piece that strikes the emotional core of the unprecedented losses we are facing as a result of our rampant consumerism, then I might be able to make a difference. Hear the world premiere of Consumption at the London Symphony Orchestra Soundhub Phase II Showcase on Saturday 9 February at LSO St Luke’s. Click here to find out more and book tickets. This story was posted by London Symphony Orchestra Soundhub Composer Lillie Harris. Creative Carbon Scotland is committed to being a resource for the arts & sustainability community and we invite you to submit news, blogs, opportunities and your upcoming events. The post Guest Blog: Picking a battle – How to find the right subject matter appeared first on Creative Carbon Scotland. Festivals Edinburgh is looking for an Environmental Sustainability Officer to join the team on a part-time basis. Festivals Edinburgh is the high-level organisation, created and driven by the directors of Edinburgh’s 11 major festivals, to take the lead on their joint strategic development and to look at over-arching areas of mutual interest. This role supports the collaborative environmental sustainability work of the Edinburgh Festivals, facilitated by Festivals Edinburgh to both reduce the environmental impact of the Festivals and their activities, but also to explore their contribution to positive environmental change through their way of working with partners, artists, audiences and their wider stakeholders. 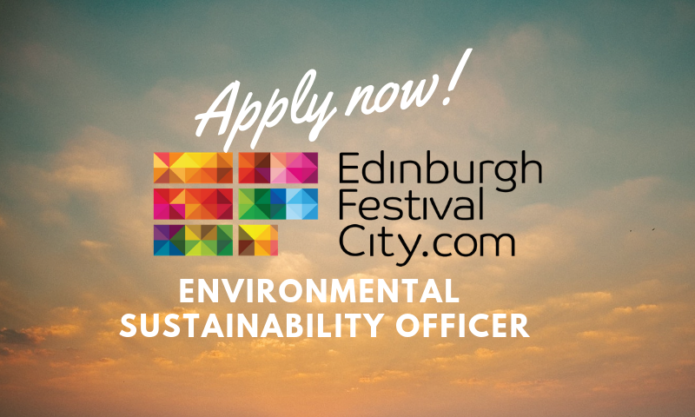 We are looking for a knowledgeable and driven individual, with strong attention to detail, and an ability to support and propel the environmental sustainability ambitions of Festivals Edinburgh and its member Festivals. The job is part-time (2.5 days per week) within standard office hours of 9.30 am – 5.30 pm, Monday – Friday. At times, it will be necessary to work flexible working hours e.g. 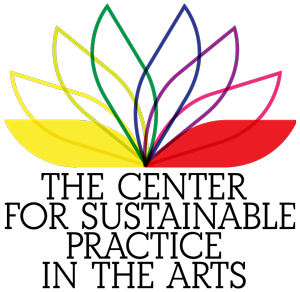 to represent the organisation at external events, forums and conferences. Payment of overtime is not applicable to this post, but Time Off in Lieu will be given at the discretion of the Line Manager. Occasional travel within the UK will be required. For further information on this role, please download the full job specification. The post Opportunity: Environmental Sustainability Officer at Festivals Edinburgh appeared first on Creative Carbon Scotland. How do you do #GreenArts? 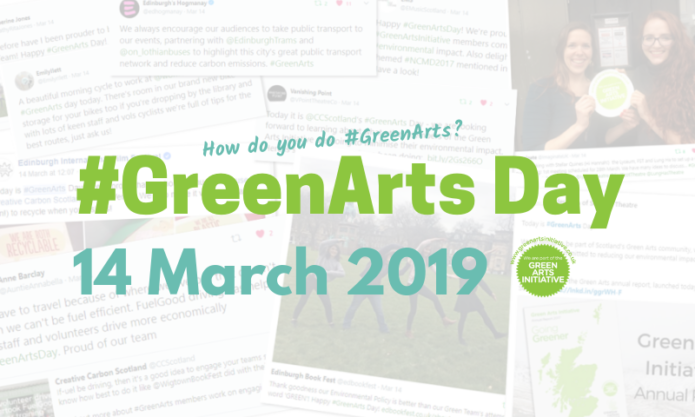 Get set to join in with #GreenArts Day 2019 on Thursday 14 March to share your work, find out about what’s happening in the cultural sector, what sustainability in the arts looks like, and how we all can contribute to a better and more sustainable Scotland. #GreenArts Day was held for the first time in March 2018, it was an exciting day of stories from across Scotland’s cultural sector and beyond, reaching an audience of over 1 million people! This year we hope you’ll join us in making it even bigger and better. 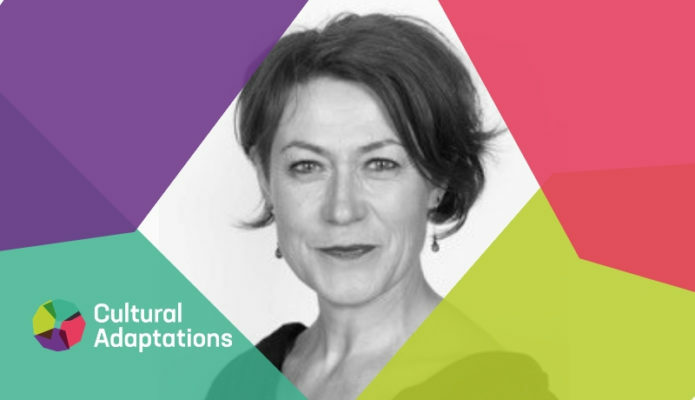 What can I expect from #GreenArts Day 2019? We were overwhelmed with the huge number of organisations and people who got involved with #GreenArts Day 2018 across all sorts of different channels, you can get a sense of the day from the #GreenArts Day 2018 twitter moment. As part of their membership of the community, our Green Arts members report each year on the actions they’ve taken, and the ambitions they have for their environmental sustainability efforts. This year we’ll be live publishing the report during #GreenArts day, pulling out key activities, insights and member successes. For an idea of previous annual reports, and to get a sneak peak of what might be in this year’s edition, take a look at the Green Arts Initiative Annual Report 2017. #GreenArts Day is a great moment to announce new initiatives to achieve even more ambition in creating a better, sustainable Scotland (and world). #GreenArts Day 2018 saw the Scottish Government supported announcement of HebCelt’s ban on single-use plastics. 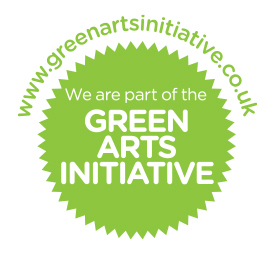 It is free for any cultural organisation in Scotland to join and participate in the Green Arts Initiative. To find out more, and to become part of the community, head on over to our project page. We currently have 220 members from across Scotland, and we guarantee you’ll spot some you already know on our interactive map. Are you launching a new sustainability initiative? The post How do YOU do Green Arts? Get planning for #GreenArts Day 2019: Thursday 14 March appeared first on Creative Carbon Scotland. PLATFORM: If you are an early career artist ready to showcase your work, Edinburgh Art Festival would like to hear from you! Founded in 2004, Edinburgh Art Festival is the platform for the visual arts at the heart of Edinburgh’s August festivals, bringing together the capital’s leading galleries, museums and artist-run spaces in a city-wide celebration of the very best in visual art. Each year, the Festival features leading international and UK artists alongside the best emerging talent, major survey exhibitions of historic figures, and a special programme of newly commissioned artworks that respond to public and historic sites in the city. If you are an early career artist ready to showcase your work, we’d like to hear from you. We are delighted to announce the call for proposals to participate in Platform: 2019. This will be the fifth edition of our annual initiative designed to provide a dedicated opportunity for artists at the beginning of their careers to participate in the Festival. Between 3-4 artists selected through the Open Call, will be invited to present their work in a group exhibition as part of the 2019 Festival. Selected artists will receive an artist’s fee, a dedicated budget to support the production of new work, and will be supported by the Festival team, with opportunities for individual mentoring throughout the development of the exhibition. Platform: 2019 is part of the Platforms for Creative Excellence (PLACE) programme, launched in November 2018 by the Edinburgh Festivals, the City of Edinburgh Council and the Scottish Government. * Current students will not be eligible. To apply, please use the Platform: 2019 Proposal Form on the Edinburgh Art Festival website to tell us about your practice, and propose a project you would like to develop for Platform: 2019 (including information about the likely costs). 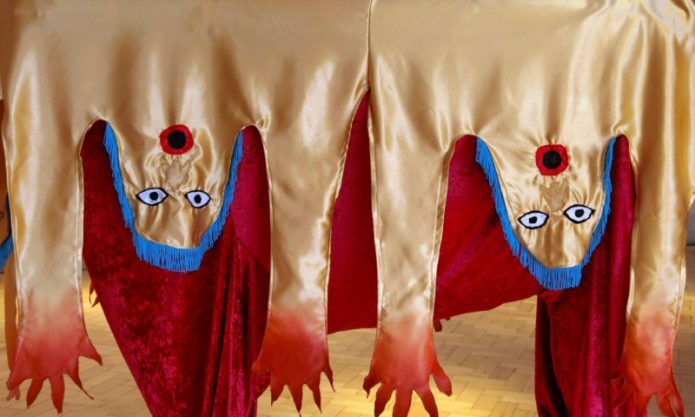 Submissions will be reviewed by a panel comprising Edinburgh Art Festival Director, Sorcha Carey and artists Toby Paterson and Monster Chetwynd who have previously been commissioned by Edinburgh Art Festival. The panel will select works on the basis of their eligibility and individual quality, with a view to forming the strongest collective presentation. The selection panel can only assess applications on the basis of material submitted. It is therefore essential, and in your interest to supply the highest quality visuals possible that fully represent your work. Please be aware that while a website portfolio can provide good supporting documentation, the dedicated images or links to specific material for your project requested in the form will be the key materials reviewed by the panel. Work in any medium will be considered, and the production budget should include any costs related to your proposed activity. Collaborative proposals may be considered, but the limitations to the fee and budget offered should be taken into consideration within any collaborative proposal. Due to the high volume of proposals received we are unable to offer feedback to proposals that are not selected. Dedicated production allowance for each participating artist (up to a maximum of £2,000), to include any external production fees, expenses and related costs, materials, equipment, etc. Festival Print Platform: 2019 is listed in the Festival Guide, with text, images and artist biographies. The Festival Guide will be distributed widely throughout Edinburgh and the rest of Scotland, to partner galleries and cultural venues. Exhibition signage and an information booklet will also be produced for Platform: 2019.
at www.edinburghartfestival.com. Information will also be sent via our weekly festival enewsletter, giving subscribers up to date information on the latest exhibitions and events. to share relevant content on their own pages to highlight to wider audiences. and media outlets to promote Edinburgh Art Festival. Completed proposals should be received by midnight, Sunday 3 March 2019. Please email to programme@edinburghartfestival.com with the subject line Platform: 2019. Emails should be no larger than 5MB. For attachments or large files, please use a file sharing facility such as WeTransfer. The post Opportunity: Platform : 2019 Open Call at Edinburgh Art Festival appeared first on Creative Carbon Scotland. Energy Revolution is a charity with a mission to help the live events industry tackle the negative environmental impacts from fossil fuel travel to events. 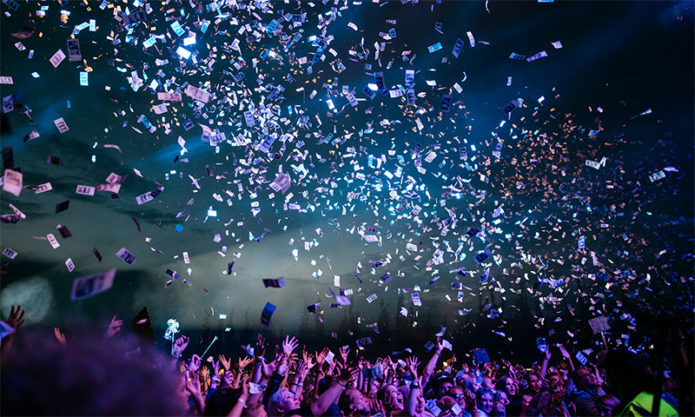 In 2018, it helped its members, from a growing number of festivals and their audiences, suppliers and touring artists, to balance or ‘offset’ the carbon emissions from over 3 million average car miles to events – the equivalent of 962,274 kg CO2e. Since it was founded in 2015 Energy Revolution has supported its members to balance over 8.4 million average car miles – that’s more than 2.6 million kg CO2e – with donations in previous years supporting reforestation and wind turbines in India and community-owned solar and wind projects in the UK. The post News: Festivals and Tours turn travel CO2 into Solar for Schools appeared first on Creative Carbon Scotland. We are looking for collaborators for a Documentary made on E-waste Workers in New Delhi, India. New Delhi becomes the hub of e-waste collection and dumping ground for the entire country. Not only the country waste, but it is also being imported from outside countries. Over 95% of e-waste generated is managed by the unorganised sector and scrap dealers in this market, dismantle the disposed products instead of recycling it. About 4-5 lakh child labourers in the age group of 10-15 years are observed to be engaged in various e-waste activities, without adequate protection and safeguards in various yards and recycling workshops. Children, who are unaware of the hazards become incapable of working by the time they reach the age of 35-40. E-waste accounts for approximately 40 percent of the lead and 70 percent of heavy metals found in landfills. These pollutants lead to ground water and air pollution and soil acidification. High and prolonged exposure to these chemicals/ pollutants emitted during unsafe e-waste recycling leads to damage of nervous systems, blood systems, kidneys and brain development, respiratory disorders, skin disorders, bronchitis, lung cancer, heart, liver, and spleen damage. Having explored the entire process of e-waste treatment in delhi, it can be seen that the workers treating it, are at the most immediate risk. The documentary focuses specifically on the lives of the e-waste workers living and working in the market. What are their experiences, and feelings related to their work? How do they face such hazardous activities almost on daily basis, knowing the fact that this work is actually deteriorating their lives. It is sad to know that these workers are actually paying for the technological privileges enjoyed by modern humans. 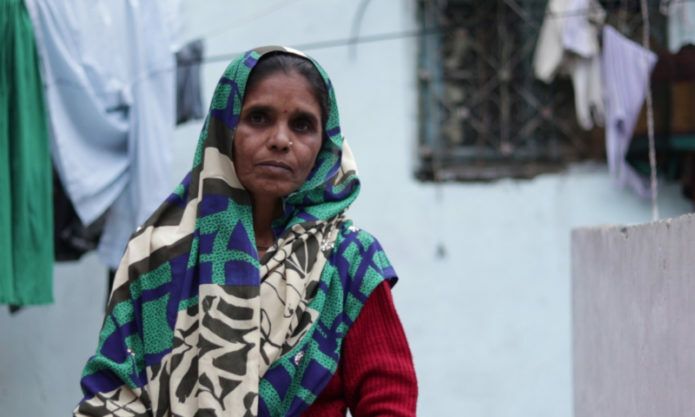 Malti, a 60 year old e-waste worker explains how well-informed she is regarding the health hazards of her work, but she still does it daily, due to lack of other opportunities. She says she suffers from breathing difficulties. The film is still in its production phase and the filmmaker is looking out for the partners – individuals or institutions, who can take this film forward in the right direction. The purpose of this collaboration is that the film could meet its right audience and generate awareness about this impending issue, which is destroying lives somewhere in the world. Watch the short version of the film and contact the filmmaker Gagan Singh if you are interested in collaborating. This story was posted by filmmaker Gagan Singh. Creative Carbon Scotland is committed to being a resource for the arts & sustainability community and we invite you to submit news, blogs, opportunities and your upcoming events. The post OPPORTUNITY: ‘HUMANS TREATING E-WASTE IN INDIA’ Documentary filmmaker looking for partners appeared first on Creative Carbon Scotland. In the final blog of a three part series contemporary artist and researcher Sonia Mehra Chawla writes about the research she undertook in Aberdeen in June 2018 to inform an upcoming residency with Edinburgh Printmakers. My artistic practice is concerned with notions of selfhood, nature, ecology, conservation and sustainability. My art spans many other disciplines and areas, and I often find myself questioning, dissecting and re-imagining spaces that exist at the interface between art and science, nature and culture, production and perception, self and the other. My work over the past few years has often been a result of sustained collaborations with Scientific and Research Institutions, Non Profit and Non-Governmental Organizations and Trusts in India, as well as interactions with fishing, farming and agricultural communities, indigenous people, and tribal communities of rural and semi-urban regions of India. In my opinion, local dynamics are worth worrying about, and localities can make a difference. Many of the individual phenomena that underlie environmental processes such as population dynamics, economic activities and resource use, for instance, arise at a local scale. As a cultural practitioner and researcher it is imperative for me to consider how local places contribute to global changes, what drives those changes, how do these contributions change over time, how and where scale matters, what are the interactions between macro-structures and micro-agencies, and how efforts at mitigation and adaptation can be locally initiated and adopted. These are also some of the vital questions that I attempt to address, probe and analyse through my research. Exhibition view of Sonia Mehra Chawla’s film ‘Altered Growth: Inner Life of the Transformed’, from ‘The (Un) Divided Mind, International Art+ Science Residency at Khoj International Artists’ Association, New Delhi. (2018) Image credit: Khoj International Artists’ Association, New Delhi. Climate change and agriculture are interrelated processes. The current and ongoing phase of my artistic practice marks a close engagement with the present and future of India’s agriculture, with a focus on the impacts of climate change and salinity on rice ecosystems in coastal regions of India. This includes research on both indigenous and transgenic rice in India, climate adaptation and mitigation, and food and nutrition security. Rice is one the most consumed foods on Earth. It is a staple in many countries including India where a large part of the population depends on the grain for sustenance. In fact, more than 90% of rice is produced and consumed in Asia. An enormous portion of rice production is lost to various abiotic stresses such as drought, flood, and salinity, and biotic stresses such as diseases and pests. In addition, changes in global climate are likely to make things vastly complicated for rice production in the future. Essentially, fragility resulting from adverse environmental conditions linked to climate change, fundamentally alters the linkages between agriculture and nutrition outcomes. When margins are slender, vulnerability to adverse climate is magnified. Sometimes this is a chronic and steadily worsening process that encourages migration with its own consequences, or even worse consequences with catastrophic climate events. Food shocks are a part of this. Then again, without the right kind of sustenance and security, climate refugees, people who are internally displaced today may become asylum seekers, refugees, or international migrants in the future. Agriculture and rural development, on a local scale can make a strong contribution to meeting the global challenge of addressing large movements of refugees and migrants. Again, if I look at my research on the impact of climate change on rice production and increasing sensitivity of rice to salinization, and because salinity tolerance in plants is a multi-genic trait, (which means that a single gene cannot confer the ability to be saline tolerant) there isn’t a single answer to the problem. The key idea then, is to raise a crop for locale specific as well as regional areas, which would provide locale specific answers to global changes in climate. Work from Sonia Mehra Chawla’s ‘Scapelands’ series. Medium: Photopolymer etchings on archival paper. Printed in the UK in collaboration with London Print Studio. The research, production and International Residency at London Print Studio in 2014-15 was supported by British Council India and Charles Wallace India Trust. Image credit: British Council India. I have been exploring the fragile and endangered coastal and mangrove ecosystems along India’s Coromandel and Malabar coasts for over half a decade. The mangroves in India are over exploited and are declining and degrading rapidly. India has already lost over forty percent of its mangroves during the last century. The Mangroves around coastal mega-cities in India like Mumbai for example, form a fragile ecosystem, and time and again, the rains in Mumbai and the disaster that follows has demonstrated the consequence of tampering with the ecology of these sensitive ecosystems. The mangroves provide a preview of the challenges ahead for ecosystems and biodiversity hotspots across the planet. 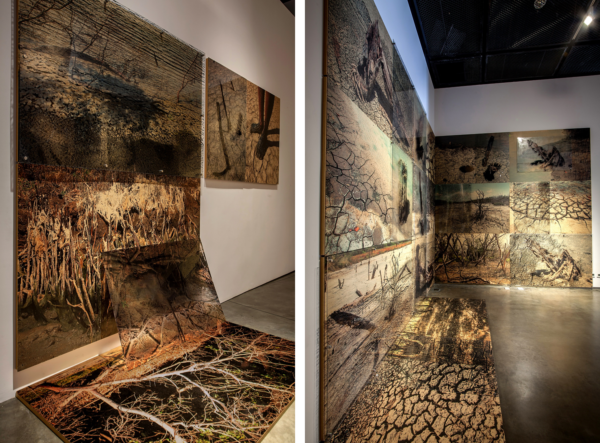 ‘Scapelands’ and ‘Critical Membrane’ are extensive series of works that I created between 2012 and 2018 on coastal and mangrove ecosystems of India. 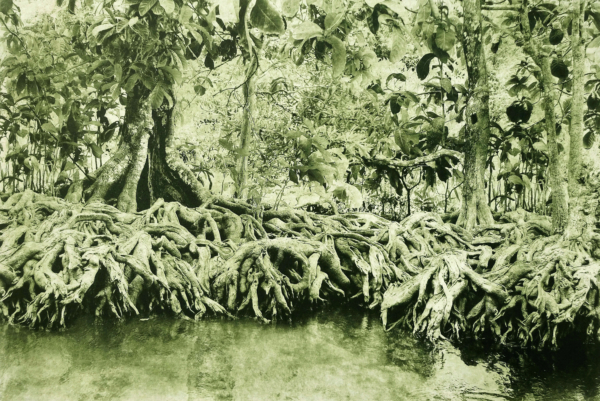 While ‘Scapelands’ explores the rich mangrove biodiversity of India, ‘Critical Membrane’ speaks about vast landscapes of loss, exploring past histories, politics, economics of consumption, and livelihoods and systems in flux. Documented extensively in degraded mangrove belts across India, these decaying ecosystems speak volumes about a living vicious cycle of depredation that is the tale of 21st century globalization. Details from Sonia Mehra Chawla’s site specific installation ‘Residue’ at Yinchuan Biennale 2016. Image credit: Yinchuan Museum of Contemporary Art, Yinchuan, China. Through my work I hope to explore the relationship between the presented history and the contemporary moment and address such questions as: What does the current prominence of these works say about this moment in India’s history and society? How do the struggles of the past resonate with the protests of the present? Do these works represent a watershed year or a seminal moment in the representation of the nation’s history and culture? If so, what is the larger significance of these works and this historical moment? India is a supporter of climate justice. There is an urgent need to respect and protect human rights, and the rights of the most vulnerable while supporting the right to development, where the burden of climate change is fairly allocated and dispensed. Global warming is after all, not just environmental in nature, it is a political, social and ethical issue as well, which connects the local to the global, and developing nations to the developed nations of the world. What we require most in a time of crisis is a human-centred approach. There is an urgent need for a combined effort in mitigation and adaptation. Historical responsibilities matter and those who have greatest responsibility for greenhouse gas emissions and maximum capacity to act, must act in more meaningful ways to completely cut emissions. Adapting to climate change is both a challenge and an opportunity. We need a cultural shift in our value-systems and ambitions to build a sustainable future block-by-block. There is an urgency to explore more inclusive, more flexible and more effective approaches to social transformation. A cultural shift provides a space for collective, improvisational and reflective modes of acting on, and thinking about a world of differentiated, multiple and uncertain futures, creating an emotional engagement and understanding needed to motivate meaningful change. I was invited to undertake the research arm of an artistic project with Edinburgh Printmakers in Aberdeen in June 2018. This research will inform an intensive print residency at Edinburgh Printmakers in spring 2019, and the outputs from this residency will be presented as part of a solo exhibition at Edinburgh Printmakers beautiful new home at Castle Mill in 2020. Edinburgh Printmakers will transform the former North British Rubber Company HQ- Castle Mills, into a vibrant new creative hub opening to the public in 2019. I hope this artistic project will serve as a platform and starting point for dialogue and conversations around some of the significant and pressing issues of our time such as the future of energy, the future of our oceans and marine life, society’s dependence on fossil fuels, just transitions, the global challenges of energy transitions, carbon reduction goals, as well as the human dimension of crisis. This is the third blog of a three part series. Read Part I and Part II. Sonia Mehra Chawla is a contemporary Indian artist and researcher. She completed a Master’s Degree in Fine Arts from College of Art, New Delhi in 2004-05. 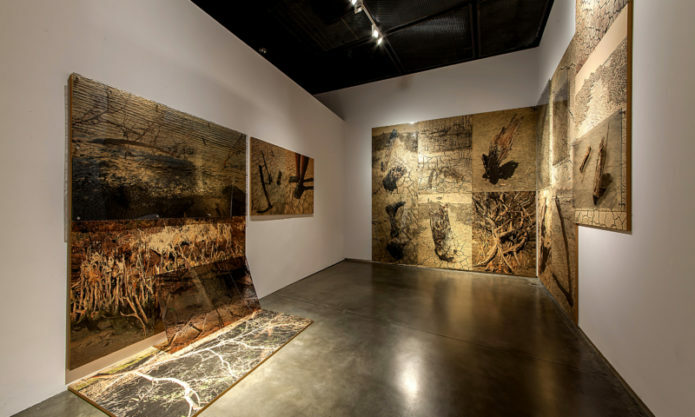 Her artistic practice explores notions of selfhood, nature, ecology, and sustainability. Sonia works in a variety of media including photography, printmaking, drawing, painting and video. Sonia was a British Council India & Charles Wallace Scholar to the United Kingdom in 2014-15, for research in printmaking, and is currently the recipient of an International ‘Art+Science’ Grant Award instituted by Khoj International Artists’ Association India & the Wellcome Trust UK/DBT Alliance for 2017-18. She has recently been awarded a six-month Fellowship from the Akademie Schloss Solitude in Germany for the Art, Science and Business Program. Her works have been exhibited at the Institut Fur Auslansbeziehungen, Germany (Institute for Foreign Cultural Relations), Tate Modern, London, Essl Museum of Contemporary Art, Austria, Museum of Contemporary Art, Yinchuan, China, Goethe Institut, Mumbai, India, CSMVS Museum, Mumbai, India, ET4U Contemporary Visual Art Projects, Denmark, and Today Art Museum, Beijing, China. The artist lives and works in New Delhi, India. ‘The Great Derangement: Climate Change and the Unthinkable’, by Amitav Ghosh. Published by Penquin India. ‘Everybody Loves a Good Drought’, by P.Sainath. Published by Penquin India. ‘Ecology without nature: rethinking environmental aesthetics’, by Timothy Morton. Published by Harvard University Press. ‘Soil, Not Oil: Environmental Justice in an age of Climate Crisis’ by Vandana Shiva. Published by Penguin Random House. ‘Water Wars’, by Vandana Shiva. ‘From Green to Evergreen Revolution: Indian Agriculture, Performance & Challenges’, by Prof. M S Swaminathan. Published by Academic Foundation. ‘In Search of Biohappiness: Biodiversity and food, Health and Livelihood security’, by Prof. M S Swaminathan. Published by World Scientific. ‘Oil Strike North Sea’, by Mike Shepherd. Published by Luath Press. ‘Old Torry and Aberdeen Harbour’, by Rosie Nicol & Particia Newman. Published by Stenlake Publishing Ltd, UK. Dr. Prof. M S Swaminathan, Prof. Colin Moffat, Dr. Leslie Mabon Sass, Alison Stuart, Erik Dalhuijsen, Nicola Gordon, Dr. James Howie, Gemma Lawrence and Dr V.Selvam. I am grateful to Edinburgh Printmakers. I extend my warmest thanks to Sarah Manning Shaw, Alastair Clark, Judith Liddle, and the brilliant team of Edinburgh Printmakers for their unfailing support, and look forward to a significant and meaningful collaboration over the next two years. The post Guest Blog: Local perspectives on a global phenomenon & global changes in local places (Part III) appeared first on Creative Carbon Scotland.